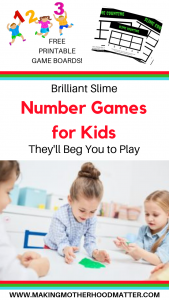 Inside: Make math fun again with a glob of slime and a few printable game boards, see how these brilliant number games for kids will have them begging you to play (and learn)! As I was strolling through the dollar section at Target, my preschooler spotted the small containers of neon slime starring at her from the shelf. After a little convincing on her end, I let her and my son each pick a container of slime. I knew if I could combine the slime with a learning activity, I would have her full attention, because of her excitement. I mean, even I can’t even resist poking the tacky neon glob of slime. 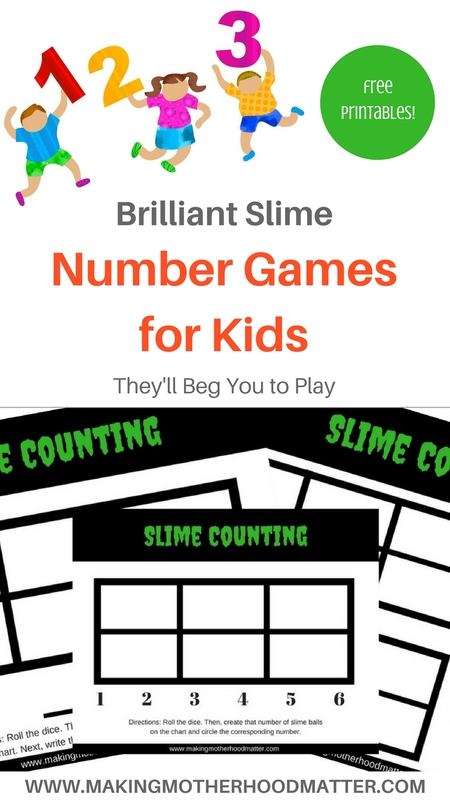 So, I created the printable slime number games that I promise your kids will beg you to play. There are three number games, depending on the level of difficulty you’d like to try for your child or student. Optional: I used a page protector for the game boards to keep the slime from sticking to the paper so the boards are reusable. The directions say, “Roll the dice. 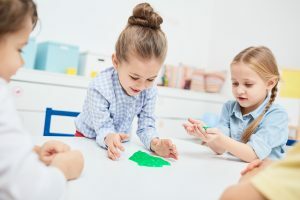 Then, create the number of slime balls on the chart and circle the corresponding number.” The child can play this as a single player game, with the help of an adult, or take turns to make it a partner game. 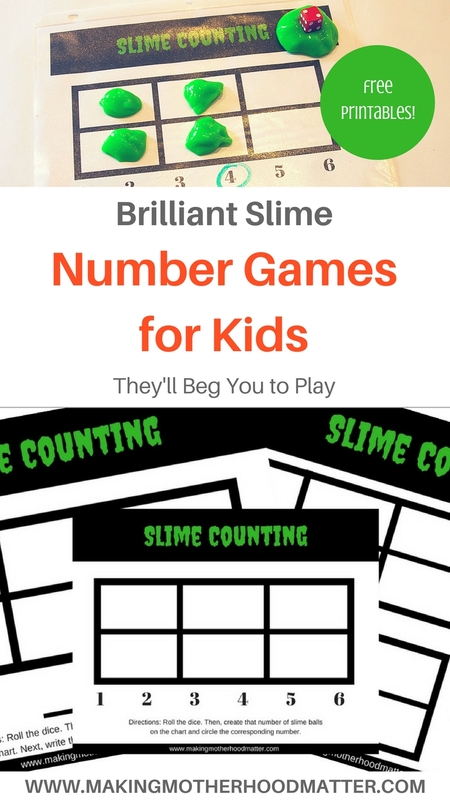 The difficulty is slightly harder, as the child has to not only make the number of slime balls but also has to write the number below (instead of circling the correct number). For the final number game board, the directions read, “Roll two dice. Create the number of slime alls on the chart for each roll. Next, add the total number of slime balls and write the number in the box.” If you are feeling really ambitious, you can even through in mathematical vocabulary words like “sum” (the total) or “addend” (the numbers added together to make the total). If you want to check out the video on my Play Learn Connect – Activities for Kids Facebook page, you can see how we played each of the number games. To keep up with our weekly kids activities, please feel free to join me on Facebook. 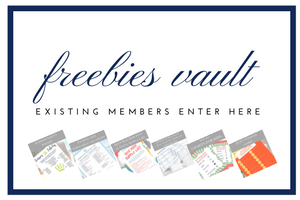 Before you go, don’t forget to grab your Slime Counting Number Game Boards and tons of valuable freebies that over 450 other members have snagged here. The packaging on the slime states that the slime should be used with kids who are five years old and up and also that the small parts can be choking hazards, so adult supervision recommended. 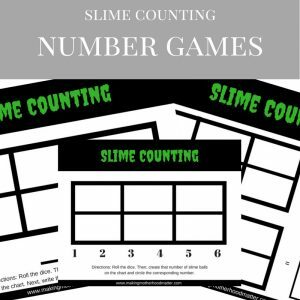 Are there other ways you would use for counting games with slime? PS – If you enjoyed this kids activity, you may also like 20 Kid-Approved Quiet Toddler Games to Make Waiting Fun.